That's my inspiration. I'd love to be able to paint like her. Labels: Mary Cassatt. Breakfast in Bed. Studying other artists and painting. Mary's is lovely, isn't it? I look forward to your finished baby, though I see that innocent, hopeful look on her face already. I don't know how you do it--portraits seem like the most difficult to me, but you have such a gift for bringing out a gesture or a look on someone's face. Love this painting, too - thanks for the inspiration, Barbara! It's always inspirational to refill the well with the work of great artists such as Mary Cassatt. Thanks for sharing this photo. Many, many years ago, before I worked in art, I copied this painting in pastel for a relative. I loved it too. I think you DO paint as well. Thank you so much for posting this. Her work is sublime. The adoring look on the Mother's face is so beautiful. And who else can use a thousand colors of WHITE so perfectly? Yes Mary's is lovely. My baby needs to be finished today, so I've been reading about how Mary Cassatt left unfinished areas. Good to know eh? Thanks so much for your encouragement. It means the world to me. Thanks so much. I'm glad you like it too. It is both a simple and a profound painting about love. Doesn't that make sense, that we like one another's work, and we have nourished ourselves on some of the same work over the years. I suppose it spills out of us. We connect on the visual plane and there is so much more we share without knowing it. Cool. Aw shucks. I do wish I did paint as well as she did. You are sweet. My question is how do you get a thousand colours of white? I know everyone tells us not to use white at all. I think that rule is as outdated as not using black at all. Sorry rule makers. I'm using what works for me! Gwen -- you're making me into a rebel, and I'm just a nice Canadian girl. 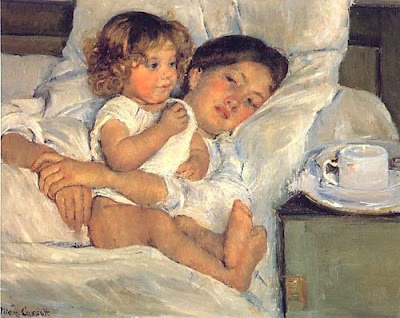 I believe Mary Cassatt's paintings are the most natural looking paintings of small children and mother's. Look at how the baby holds it's feet. So true. Your painting is looking good. Thanks so much. Yes I think Mary Cassatt probably studied children more than any other painter of her time. The feet are wonderful.